A. A woman who can do all of that and sit back and enjoy a glass of wine while it gets done for her if she wants! 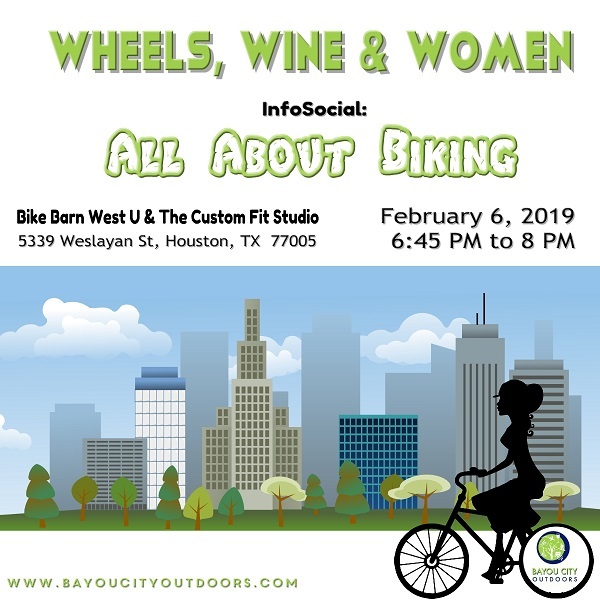 Join us for InfoSocial LIVE with Bayou City Outdoor, HTXOutdoors, Bike Barn and The Custom Fit Studio. Join us in person and connect with new women cycling friends, while you learn all about that bike you just bought or maybe left hanging in the garage a little too long! Can't make it in person? Check out the LIVE event online at our Facebook Live presentation. Both events run simultaneously, and you can join the Q&A online or in person. This week we’re talking all things cycling. We will go over what you need to know to transport your bike, change a tire (and air your tires up), fix a chain, do a safety check and time permitting shifting and clipping in. We’ll take Q&A at the of the presentation to help guide everyone into outdoor fun mastery. No need to bring your bike, we will have bikes at the site to demonstrate and practice with! Wine, snacks and refreshments will be provided. Plenty of parking in the lot.